X-Treme Muzzleloading wins Prize at Southeastern Outdoor Press Assoc. Conf. X-Treme Muzzleloading took a third place price at the Southeastern Outdoor Press Association’s (SEOPA) 2013 meeting at Lake Charles, Louisiana. Wm. 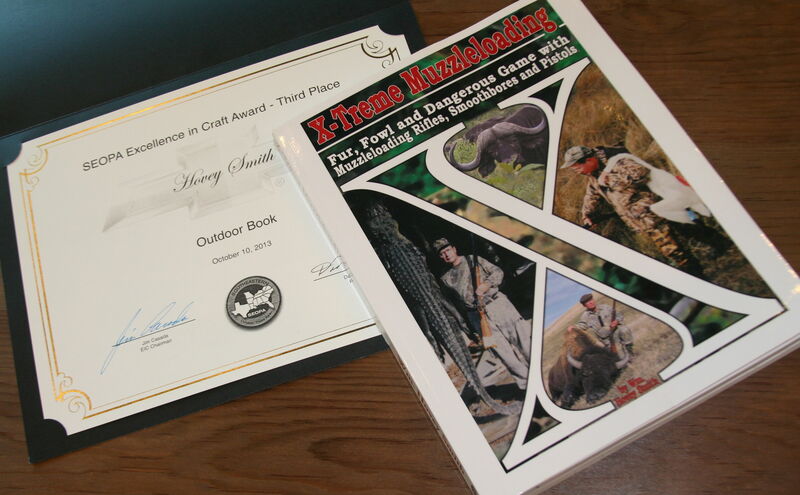 Hovey Smith’s book “X-Treme Muzzleloading: Fur, Fowl and Dangerous Game with Muzzleloading Rifles, Smoothbores and Pistols” took the third place book price at the 49th Annual Southeastern Outdoor Press Association’s (SEOPA’s) annual conference in Lake Charles, Louisiana. This 9 1/2 X 11-inch book is noteworthy for recording the details of the guns, loads and hunts that the author has done with muzzleloading guns over the past 50 years. Contained in the book are over 100 illustrations, load tables, an index and wild game recipes. Hunts covered in this book include those for small game, big game in the U.S., Europe and Africa and also unusual species such as alligators, armadillos, ostrich, swan, warthog and zebra. Guns used include matchlocks, flintlocks, percussion guns, 209-primed in-lines as well as with original firearms in cleaned, but unrestored, condition. The book is available in softcover and as an E-book from Apple’s iBookstore, Amazon.com, Barnes and Nobles and other book and E-book outlets.